The bag kept my cold foods stay cold. Great for potlucks and church socials! My comments on the smaller version hold good for this one, too. This larger one comes in handy for any time you need to take a family size container of food to a picnic, a potluck, or another type of social event. I was able to get a 4 qt. oval crock pot inside, although I had to slide it in from the side to make it fit and carry it that way. Keeps things pretty hot, and for extra cold, especially on longer trips, I recommend 'blue ice' freezer packs. It works great! You can use it to keep frozen foods cold on hot days on the way home from grocery shopping, etc., BTW. This bag was exactly what I wanted and just like pictured. I was very pleased. I ordered two of these to keep in the trunk of my car for perishables and could not be more pleased with them. They are a good size, very well made and are exactly what I needed. I intend to get a lot of good use out of them. Love this to transport food ! Both totes, large and small, always go with me to the grocery store. I live 20 min.away so I really use these totes to keep my cold items (esp. ice cream & milk) cold on the trip home in a warm car.On trips out of state(sometimes 4-5 hours) I pack the cold food and several small ice packs. Everything stays just as cold as when I left home and the ice packs have barely thawed. 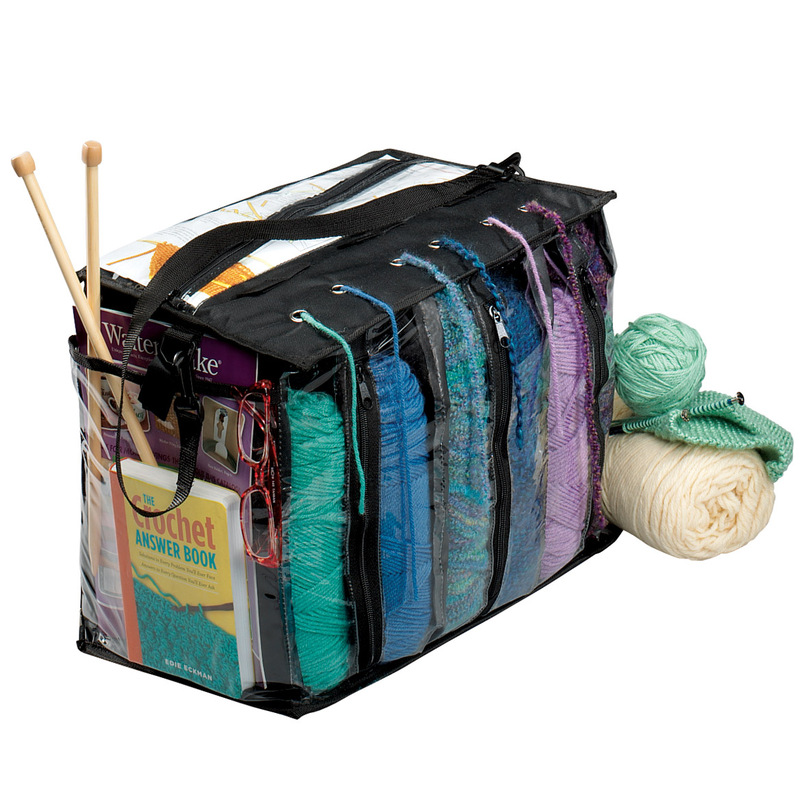 Numerous friends and family members have requested these totes as presents because they have seen how useful and compact they are. I could easily use another set just for shopping. I would buy this product again and again, in fact I DID!! I brought the tote bag to my daughters with frozen items in it. When she saw it, she asked if she could keep it for their visits to the water park. I said yes and ordered another one! (: It works for all of us!!! Very useful bag for carrying items when the weather is especially warm, very roomy bag. I use it as an insert inside of larger duffle bags. Wish we had larger sizes available.. Very well made, very durable for travel. We keep these bags in the car for transporting perishables home from distant shopping destinations. They really do keep things cold. After a while, they do wear out--zipper separates from the fabric; bought this to replace one that had seen its day. I love my tote and I love the look of it. I'm going to order the smaller one since I ordered the larger first. Really handy and so attractive. There is an odor at first but just leave it out and after a day or 2 it's gone. I really love my tote! We use this when we go on vacation to New Mexico. We put in items from the freezer and frozen water. Then we wrap it with an old Mexican blanket and it is still froze wen we get to New Mexico. Love it and will buy again. I use this to take stuff home from grocery shopping at the clubs. It works fine and keeps stuff cold. Satisfied. I keep this in my car for grocery shopping. It keeps my meat and cold products perfectly cold when I get it home and in 100+ weather, this means it all. No spoilage! Also, use for taking hot dishes to church dinners. I love it! This bag is great... I'm at least 25 minutes from the nearest grocer so it is essential that my cold purchases are still cold when I get home. The bag will hold a couple of steaks/chops, some chicken, eggs, yogurt, and yes ice cream. I even got one for my husband, who stops at our favorite pizza joint (28 miles away) for frozen pies for us to enjoy at home. There are many uses for these bags, but these are MY favorites. I purchased the bag particularly for my son to transport groceries from my home to his. I shop online and have my groceries delivered weekly. they often have some excellant deals so I will buy those items on special that I know he and his wife use/need/enjoy. since they live more than 30 minutes away from me the bag protects perishable foodstuffs from spoilage during the summer months. I am very pleased with this purchase. Good for keeping food cold when grocery shopping. I wish it were larger like the former red and black plaid bags you used to carry. to transport food from grocery store.it is way too small. advertised as xlarge. it isn,t. i ordered it and the next day ordered more items, and it was still on my cart so a was sednt 2 of them seperately. poor service. sent one back unopened, still waiting for refund. I like the bag a lot, but it doesn't alst all that long. It comes apart at the seams, which makes it less insulated and less attractive. Soon it'll fall apart so much I'll need to get another one. I thought it was larger than this actual size. I guess I need a jumbo. I would consider this as a medium size. Will keep to use when going to an event or dance to keep things cold. 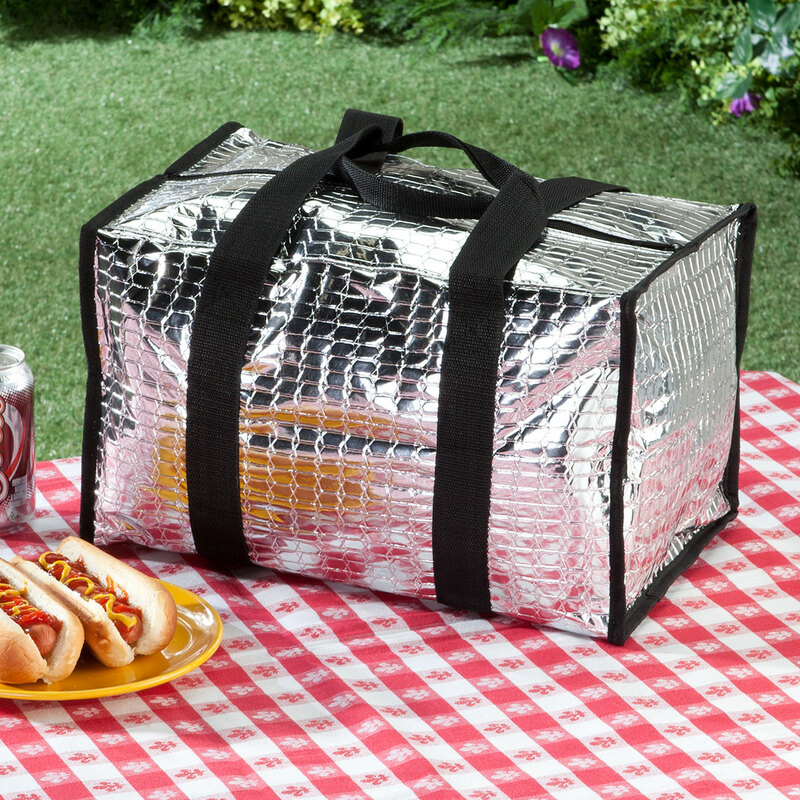 This tote keeps food cold or hot, but it is difficult to put the foods inside the bag. The zipper is straight down the middle, and should have a zipper that zips around the top of the bag. This is the 2nd bag I have had. Both lasted only a few months before tearing. Before they tore, the bag worked great - keeping my frozen foods completely frozen until I got home, even in the hottest weather. But I cannot afford to replace this insulated bag every 3 months. others have said they liked the bags - So I'm giving them as gifts. These are replacements after 20 years. I have used these before in the car for grocery shopping & have been very pleased with them. I wanted a goodsized insulated bag to carry home cold things like milk and popsicles, etc. and this seems to fit the bill. Needed to transport cold items home from the store and this was big enough for me. I will work better than most insulated bags. It is insulated inside and outside. I've used these for years. They keep food cold when we travel for the weekend. I cought small one and wanted a larger bag too. It's large enough to carry what I need and is of good quality. I frequently tote food to other people's homes. To keep items hot/cold during transport. I have used these tote bags for years, and they are the best for keeping groceries cold in the trunk of my car. Grocery shopping in New York in the summers are truly brutal on my frozen food and meats. I keep it n the trunk if I need to use it for groceries. Very handy. When traveling in afar always like to have chilled water & fruit available. It gets very hot here. I have some insulated bags but need more to get things home from the grocery store and even farmers market. Two years ago I had stopped for lunch before going home from farmers market and had half of my fruit purchases cook during that hour the car was closed. To transport some of the family bbq foods to park to stay warm. I bought this to put some refrigerated groceries in when I have to make other stops before home. I need to order another as family has taken it to use on their trip back home and keep sandwiches and drinks in it. I really liked it! 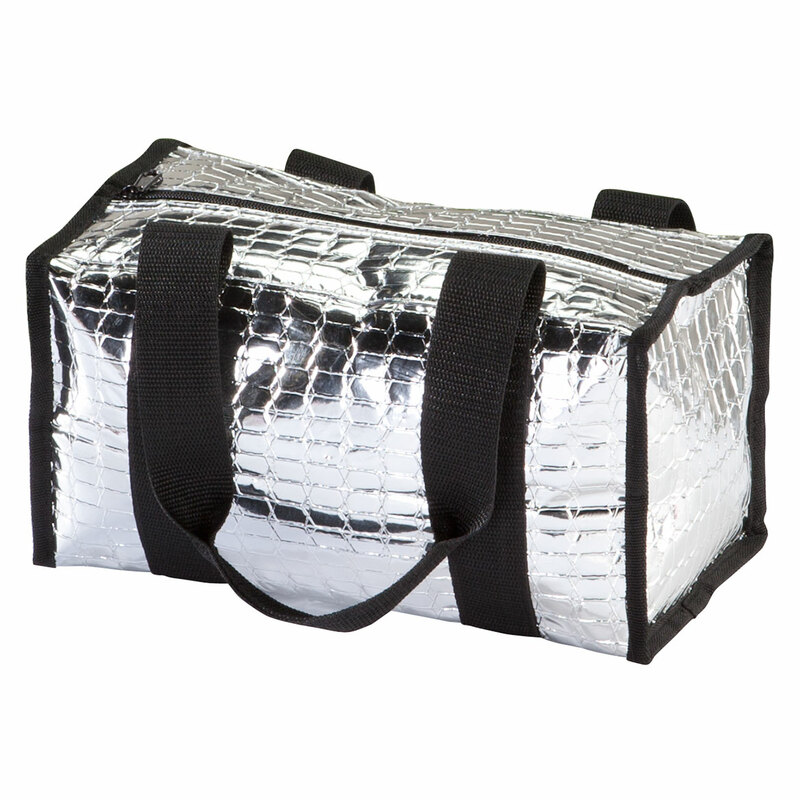 Need to keep groceries cold and summer lunches cold in car. Keeps meat cold when i drive home from the market. Even frozen food stays cold and milk. Does the job. Same if you pick up hot food. How does it seal at the top? By use of a zipper or perhaps magnetically? BEST ANSWER: A zipper closes the bag at the top. It zips accross the top. does this tote have a solid bottom? BEST ANSWER: I would not call it a solid bottom, but it is pretty sturdy. The bag will hold about 15 lbs of groceries, although I do hold it from the bottom when it's heavy, so that the pressure on the handles is reduced. 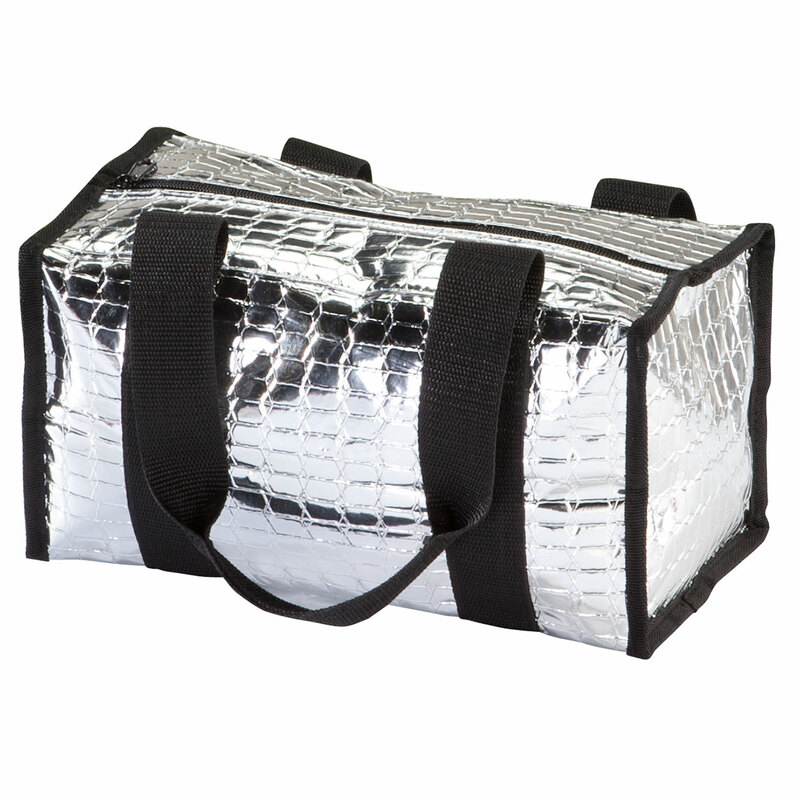 I love this bag - it really does work to keep your frozen items frozen from the store, even in hot summer Florida days! No, it does not. It is soft sided all the way around. When will the large tote be available again? BEST ANSWER: Thank you for your question. At this time, we do not have an in stock date for this item. We hope this information will be of help to you.